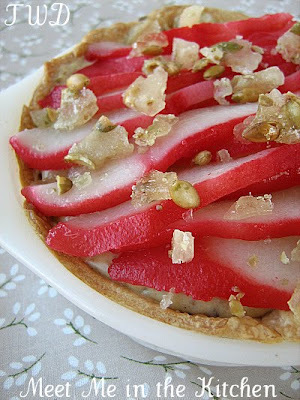 I have had my eye on this Rosy Poached Pear and Pistachio Tart ever since I got my copy of Baking:from my home to yours. It just looks so beautiful and the combination of pears and pistachios sounds amazing. Lauren, who blogs over at I'll Eat You chose this weeks TWD selection. You can find the recipe on her blog or on page 370 of Dorie's book. I switched a couple of things in this recipe just because of things I had on hand at the moment. I had candied pepitas and a mini pie crust leftover from this Pumpkin Cream Pie, so I decided I was going to make 1 mini pie, using the pie crust I had and the candied pepitas. I only poached one pear and I used juice instead of wine. My pear was not turning "rosy", so I decided to add a couple of drops of red food coloring to the poaching liquid. My pear was bright red. When I sliced it, it resembled imitation crabmeat. Not a good thing. Oh well. I used it anyway, because I didn't have another pear. 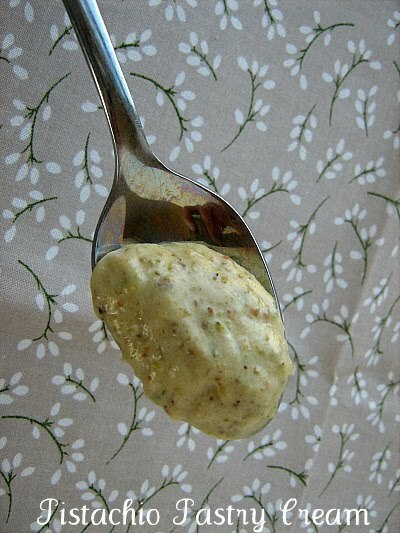 I made 1/4 recipe of the pistachio pastry cream, which was really delicious. I left the nuts in. All in all, this was a delicious tart. I think it would be even better with a tart crust. Go check out the TWD Blogroll and see what everyone else did with this week's recipe! Beautiful tart! I love how pretty all of the pears are looking this week. I didn't get around to this one yet so we'll see if it happens today. Glad to hear you enjoyed it! Ha, imitation crabmeat! LOL!!! I think your tart looks great and that pastry cream came out beautifully!! Great job!! I thought poaching the pears was so much fun! hehehe imitation crab meat! i think it looks beautiful! I didn't even think of imitation crabmeat until you said something about it! I think it looks lovely! I don't know if I've tried a red pear.. but your creation looks beautiful and delicious! imitation crab-- that's too funny! bet it was good anyway! Your tart looks great! It really was delicious with the tart crust. I never would have thought of imitation crab meat, but now that's all I can think of when I look at your pears! Too funny! I was jealous of the rich colour of your pear until you spilled the beans. It still looks perfect to me. Your tart looks fantastic! How nice that you actually had suitable substitutions all ready, I would have loved to eliminate a step or two this weekend. But I still think it looks pretty. You made it and I didn't, so that means you WIN! Love your efforts and your baking spirit! Your tart is beautiful! If you hadn't said something, I never would have known that it wasn't wine that colored you pear! I had too much going on and haven't gotten to this one yet. I'm hoping to make and post it before next Tuesday, it looks and sounds so wonderful! I love your little tart! the pistachio cream looks delicious - I wish I could taste it right off of that spoon. My hubs doesn't care for pistachio, so I used almonds. This one was involved, so good for you in having 2 elements on hand! 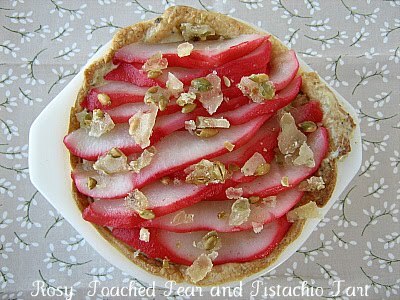 What a pretty tart and great combo of flavors! It looks really pretty! Once again, well done! I love the color you got on your pears! This looks so beautiful, I think the color is fantastic! I love the spoon with the cream on it...delicious! Very pretty. I am going to be sorry I skipped this one...might have to go back soon and do it. Matt is allergic to pears, so maybe when he is gone some weekend.